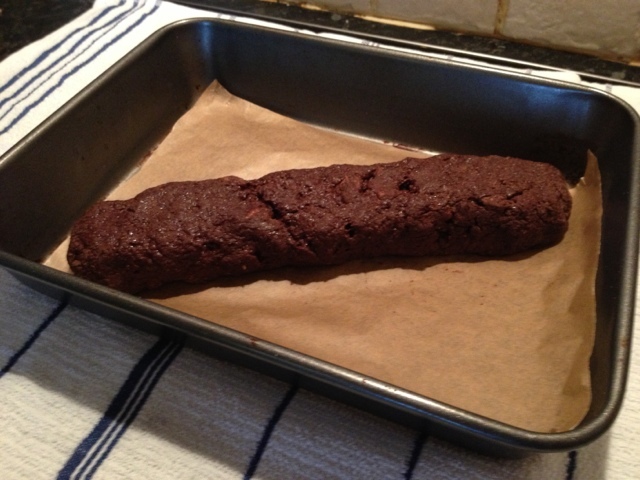 For today's baking I decided to try a recipe I haven't done before for Italian chocolate and nut biscotti. These contain no butter so have less than 75 calories per biscotti. I have added an additional dark chocolate twist to this which will result in a slightly less sweet biscuit. 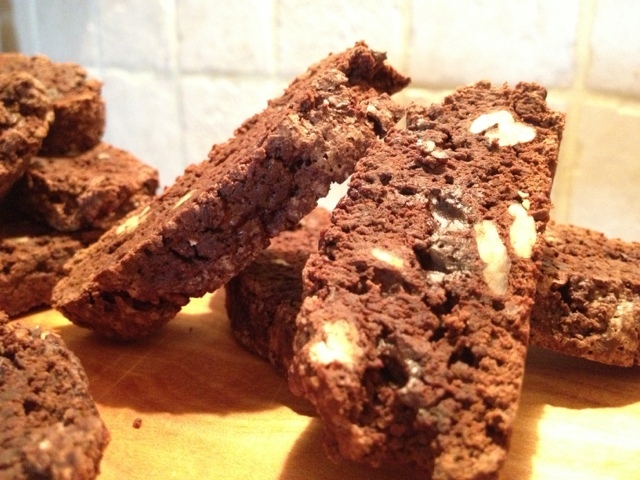 If you prefer the more traditional style biscotti drop the cocoa from the recipe below. This should make about 15-20 biscuits that will keep for up to 4 weeks in an airtight container. 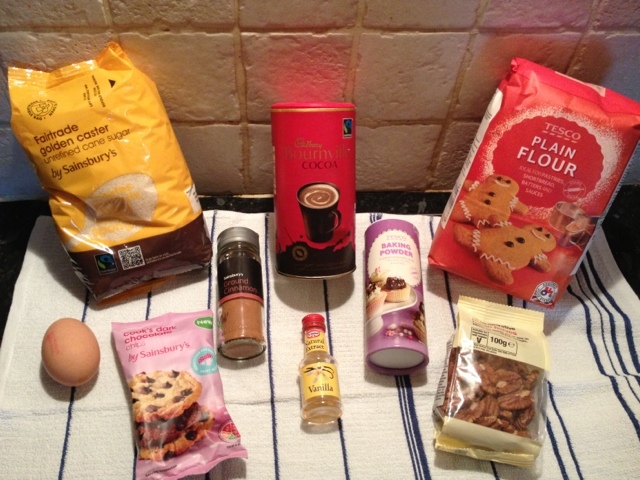 Put the flour, cocoa powder, sugar, cinnamon and salt into a large bowl and mix. Make a well in the bowl and add the remaining ingredients. Use a folk to form a sticky dough. 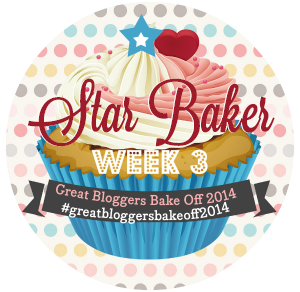 Turn out the dough onto a floured surface and gently knead into a ball. Roll into a 25cm (10in) log shape. Put onto a non stick baking sheet, flatten the top slightly then bake for 20-25 minutes until a cracked crust has formed. Lower the oven temp to 150C (gas mark 2). 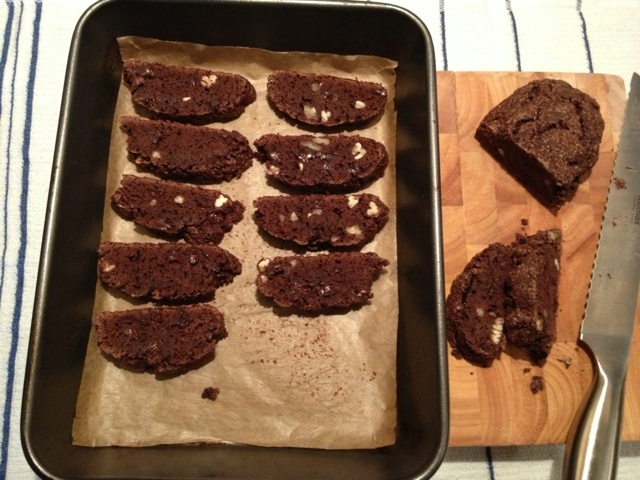 Gently transfer the biscotti log onto a chopping board and slice diagonally at 1cm intervals. Arrange the slices on the baking tray and put back in the oven for 15 minutes or until dough is dry. Cool completely before dunking and enjoying!